things that make you go O_o | Kris + Books = Good. *Sometimes*. ‘Cos I have to tell you that it took me a while to ‘see’ what was going on. Then again I can be deliberately conveniently completely oblivious at times. This entry was posted in book covers, things that make you go O_o. Bookmark the permalink. I must be plain old oblivous then because my only reaction was “gross”. Bleeding chick, not hot. I'm with Tam. In fact, it looks like a nosebleed from the way she's positioned. Ick is the word! Oh, is that her hair going across her face? That was my reaction too, Tam. And why do they have it so we're looking up her nose? Slimer from Ghostbusters was shot and killed and that his blood running down the wall. The chick is mistress who may have shot him. I'm in the Oblivious Camp with the others. I still don't see it. Umph. 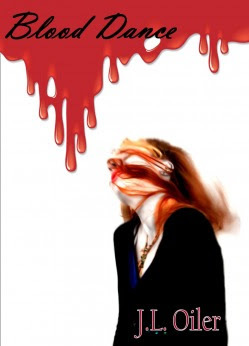 If that's indeed her hair like Wren suggested, I can only say that the cover was badly designed because it does look much more like a bleeding woman. That's the only thing I could see until I read the comments. And her mouth looks like the Joker's. Eurk. Did you send this to Wave for her contest? This deserves a spot. Oh no….. poor woman is getting attacked by a bad hair dye job! No seriously I became a red head on saturday and now I'm really really scared. Will my hair now attack me as well? All I see is a gross cover. And I don't like that you can see into her nose. No, dear, no bats in the cave…too much blood methinks. Ew. Even I, horror maven that I am, would not be inclined to delve into this book. Woman on cover = bad sign. Blood-drenched woman on cover = avoid. So here's where I confess… my first thought was 'whoa, why is there a bleeding pig head on that body?' Yes, it is true. I thought it was an Animal Farm vampire tale. Tam: As per the above, I got the bleeding part but not the chick part. Val: Well, you guessed it was chick so that was more than I did at first. Wren: It took me forever, but, yes, that's her hair going across her face and NOT blood. Richelle: I thought it was a snout so when I came to realise her hair was tilted back and we were looking up her nose it seriously didn't bother me. No it did not. I see something that resembles my attempts at using Photoshop -> an indefinable mess. But I like Natasha's take on it – bad hair dye job… and now her hair is trying to suffocate her in retaliation! Katiebabs chook: Now that's just silly. If Slimer was shot, it would be green. Just sayin'. Lily: *snort* I, after much head scratching, finally realised that it's a lady with her head tilted back and her hair flowing across her face. Mary: I didn't even notice her mouth! *goes back to have a look* Eek. KZ: Well, it is a vampire story so blood kinda goes with the territory. Just go away and read it Sissy, by the time I've finished with the head separator you will have finished and you can reveal all! Mumma: I get the impression you're feeling a little blood thirsty today. You know how we were going to get together? Well, I think it would be a good idea if we put it off for another day. You can be a leetle scary sometimes. Chris: But did you think it was a pig head?? I'm really hoping that I'm not the only one out on this limb here. Well, let me tell ya, that is one graphically confusing way to convey “vampire story.” There sure as shite seems to be a connection between the drippage and whatever is slapped across the girl's face. Any Idea who the cover artist is…. KZ: So noted. 🙂 Also, I'm pretty sure I'm going to have to read this now just to see if the hair slapping relates to the story at all. Lucky for me the blurb looks interesting-ish. EH: I can tell you with all honesty that it wasn't me. Other than that… no idea. I did have a quick squiz on the Wild Horse Press website, but couldn't see a name. But I had Animal Farm as a reference. A Marcel Marceau version of Toad from Wind in the Willows just won't cut it. No, I'm awesome. Granted there's a fine line between it and weird, but I think you'll find that I am on the side of epicness. Are your eyes brown by any chance? Chris: Oh. You're talking about chocolate and how sweet I am. Now I feel guilty for saying that you're weird. Sort of. Lily: I don't know what you mean. OMG, THAT REDHEADED LADY IS HAVING A SEIZURE ON A WINDY DAY! AND THAT RED PAINT IS TOTALLY ABOUT TO SPILL ON HER! OMG, GET ME PHOTOSHOP AND SOME HAIR DYE STAT. IT'S OBVIOUSLY THE RED HAIR THAT'S THE PROBLEM HERE!!! Too right, Orannia. That Chris can be act very strangely sometimes. Oh, you meant the cover. Wait, isn't it like o'dark hundred there? Why are you awake? You have to ask?? LOL.